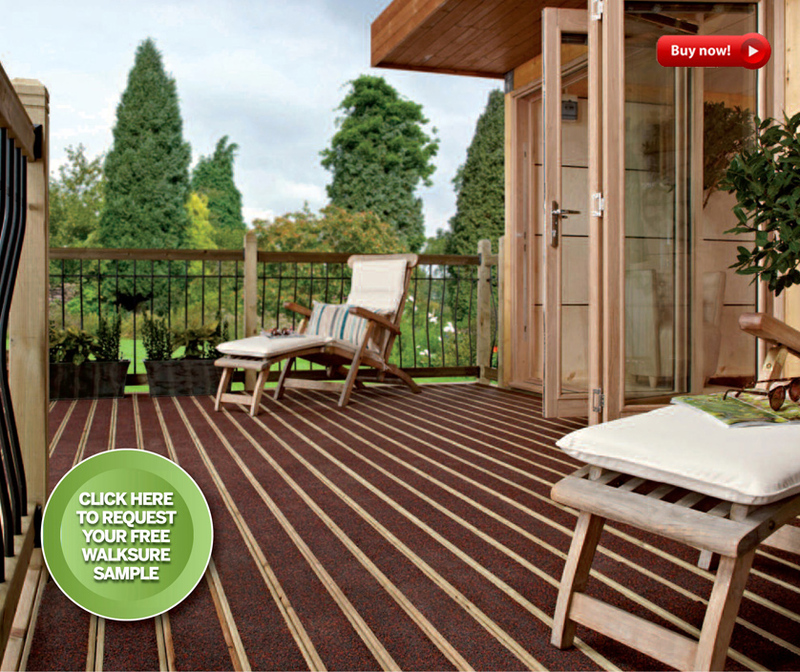 Vincent Timber - Walksure Decking from Metsawood. 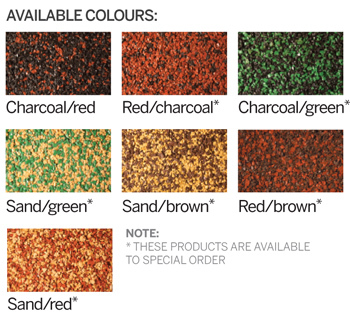 An attractive and colourful alternative to traditional timber decking but also a safe, low slip surface in wet or dry conditions, ideal for play areas and pool surrounds. WalkSure is rated as 'low potential for slip' tested to BS 7976 part 2. WALKSURE IS RATED AS PROVIDING 'LOW POTENTIAL FOR SLIP' WHEN INDEPENDENTLY TESTED TO BS 7976 PART 2 TO CONFORM WITH UK SLIP RESISTANCE GUIDELINES. IMPORTANTLY WALKSURE ACHIEVES THE 'LOW SLIP' RATING IN EACH OF THE THREE TEST PROCEDURES, ACROSS, DIAGONAL TO AND ALONG THE BOARD LENGTH. REGULAR CLEANING WITH A MILD DETERGENT, TOGETHER WITH TREATMENT OF EXPOSED TIMBER COMPONENTS WILL HELP TO MAINTAIN WALKSURE DECKING. WALKSURE CAN BE CLEANED USING A JET WASHER AT A PRESSURE UP TO 1500 PSI. METSÄ WOOD RECOMMENDS THAT WALKSURE IS FACE FIXED WITH 2 x 63MM COATED DECKSCREWS AT EACH JOIST. SCREWS SHOULD BE DRIVEN DOWN BELOW THE SURFACE OF THE RUBBER WHICH HIDES THE SCREWHEAD AND PROVIDES MAXIMUM HOLD. METSÄ WOOD HAS APPROVED THE USE OF DECK-TITE 4.5x63MM TRI-LOCK GREEN COATED DECK SCREW WHICH CARRIES DECKMARK ACCREDITATION. IF DECK BOARDS ARE CUT THE SAWN ENDS SHOULD BE RE-TREATED WITH A SUITABLE TIMBER PRESERVATIVE. SUPPORTS SHOULD BE SET AT A MAXIMUM OF 450MM CENTRES. A SLIGHT FALL SHOULD BE INCORPORATED INTO THE DESIGN TO HELP IMPROVE DRAINAGE. PLEASE REFER TO OUR DECK FIXING GUIDELINES BROCHURE FOR MORE DETAILS. Time from application of nut to extinction: 383-425 seconds. Sizes are accurate when timber is machined. Timber will move during different climatic changes for which we have no control over whatsoever. We reserve the right to amend profile dimensions without notice. Please check current dimensions with our sales office if you are matching up profiles that have been supplied in the past.